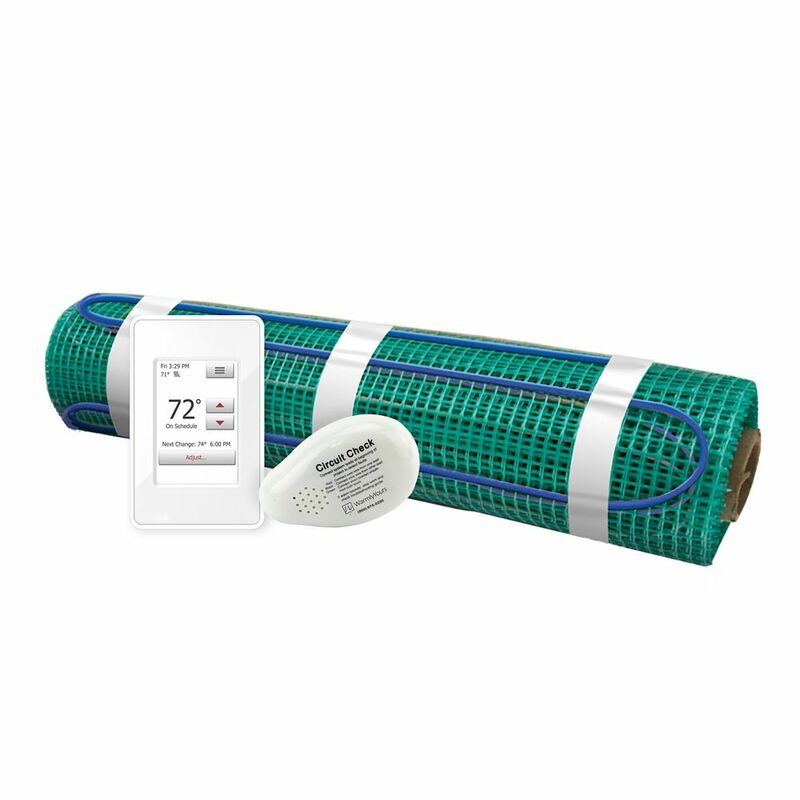 Floor Heating Kit 240V-Tempzone Flex Roll 1.5 Feet x 14 Feet + Touch Screen Thermostat The kit with mesh is designed for applications under tile, stone and nailed hardwood floors. TempZone Flex Roll allow for radiant heating at an affordable cost. Install radiant heating in front of your kitchen appliances and bath fixtures for a warm path of under floor heat where you stand the most. Come with the programmable nSpire Touch which features a 3.5 full colour touchscreen and a modern design that instantly augments any rooms style. With an integrated Install Wizard, its never been easier to set up a radiant heating system according to your preferences and schedule. The nSpire Touch allows you maximum control over the floor temperature with 4 programmable events for each day of the week, which is great for Goldilocks households where there will be frequent adjustments to the temperature or thermostats schedule until its just right. Dual voltage thermostat with sensor included. Floor Heating Kit 240V-Tempzone Flex Roll 1.5 Feet x 14 Feet + Touch Screen Thermostat is rated 3.0 out of 5 by 1. Rated 3 out of 5 by Nat61 from Thermostat Easy to install but The thermostat makes a very loud clicking noise. if I knew ahead of time I coukd of installed it in closet to lessen the noise now I’m stuck with it. I recommend you looking at other similar products and read the reviews carefully I did a little to late I’m not the first to complain about the noisy thermostat.